Manager Danny Lennon is sure St Mirren are progressing, despite sitting 11th in the Scottish Premier League. Saturday's 0-0 draw at Aberdeen means the Buddies have lost just once in their last seven league outings. "At this stage two years ago we were were 37 and 36 points off second and third in the league," Lennon told BBC Radio Scotland. "Okay, we are still at the wrong end of the table but now we are only eight points off it." 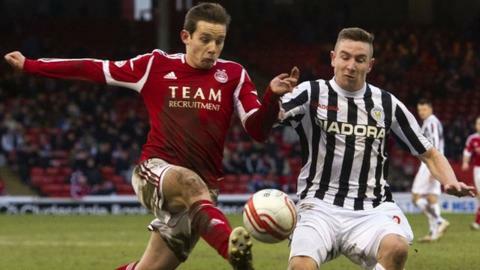 St Mirren, who progressed in the Scottish Cup last weekend, having reached the League Cup final, had a numerical advantage at Pittodrie when Dons defender Mark Reynolds was sent off on 73 minutes. And late in a game of few chances, Paul McGowan worked the ball across the face of goal to the unmarked Esmael Goncalves, but keeper Jamie Langfield spread himself to block as the striker tried to lift the ball over him. "It was good to get a clean sheet today, that has been a bit of an Achilles heel for us this season," added Lennon. "We maybe shaded it in terms of opportunities created, and certainly the one with Esma in the last five minutes, but Langfield made a fantastic save. "They gave Craig Brown and Archie Knox everything and that's what you expect from a team when they are hurting." Saints brought in Kenny McLean, David Barron and on-loan Newcastle left-back Paul Dummett, and dropped former Celtic pair Graham Carey and David van Zanten to the bench. John McGinn missed out completely. "I'm delighted with the group of players we have," explained Lennon. "Every player wants to play every minute of every game but the ones that were on the bench and sitting in the stand will have a valuable part to play. "We are ticking along nicely just now and you can see there is an added confidence."